Rhinoplasty is a cosmetic procedure aimed at modifying the appearance of the nose. Through various individualized steps during a rhinoplasty, specific aesthetic concerns can be addressed. Some patients desire removal of a hump while others look for narrowing of the bridge, refining the tip, shortening the nose or rotating the tip. Other patients may want a higher bridge, narrower nostrils or a tip that does not descend when they smile. In all cases, the results should be natural and harmonious with the overall appearance of each patient, and breathing ability should be maintained or enhanced. Factors that affect the outcome of rhinoplasty include the quality and position of the nose cartilage, the size and shape of the nasal bones, quality and thickness of the nasal skin, pre-operative nasal symmetry, the technical ability of the rhinoplasty surgeon and post-operative wound healing. During your consultation with Dr. Khosh to discuss rhinoplasty in Manhattan, he will listen to your concerns about the appearance of your nose. He will perform a careful examination of your nose, both internally and externally, and assess your breathing function and sinus-nasal health. Dr. Khosh offers computer imaging to demonstrate the potential rhinoplasty outcome. Discussion and meaningful communication in regard to your desired cosmetic outcome is crucial. African American rhinoplasty may involve reducing or even enhancing certain features associated with ethnicity. The nose is a prominent facial feature, which means that bridge height, nostril width and shape affect the frame of the face. Dr. Khosh has helped countless African American patients achieve a more aesthetically pleasing nose through rhinoplasty. With African American rhinoplasty, maintaining a natural looking appearance plays an important part in achieving the desired results for the patient. Few plastic surgeons possess the skills needed to ensure excellence in overall aesthetics and symmetry. Nasal function is another important consideration when seeking African American rhinoplasty. If you have difficulty breathing due to the shape of your nose, Dr. Khosh has the skill and qualifications as a rhinoplasty specialist to help you breathe free from obstruction. All treatments are based on expert consultation to assess the needs of the patient. Regardless of your reasons for wanting or needing African American rhinoplasty, consultation with a specialist who understands differences in ethnic structural nasal components is important. 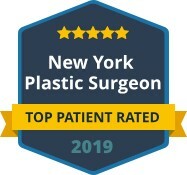 Dr. Khosh is one of the most accomplished plastic surgeons in Manhattan, providing excellence in consultation and treatment for patients facing the most challenging needs. As with any rhinoplasty treatment, how the nose complements the rest of the face is an important consideration when it comes to making alterations. The Asian nose is traditionally regarded as a delicate focal feature. Many patients of Asian ethnicity seek to alter the nose so that certain structural aspects become more pronounced. The challenge for a plastic surgeon is to provide the desired result without negatively impacting how the nose is framed by the rest of the face. To achieve the results that you want, it is important to consult with a plastic surgeon who understands the ethnic and cultural implications of altering the shape and size of the nose. Dr. Khosh specializes in rhinoplasty for ethnic patients from all over the world and has intimate knowledge of facial symmetry. Many less experienced rhinoplasty providers will sacrifice nasal function in order to deliver the desired aesthetic results. However, Dr. Khosh does not believe that you should have to choose one over the other. As a part of your consultation, all concerns that may arise from Asian rhinoplasty are fully explored and addressed to the satisfaction of the patient. The skin and appearance of the nose are impacted by the condition known as rhinophyma. More commonly known as a bulbous nose, rhinophyma can cause the nose to become enlarged and bumpy. The condition becomes worse with time, as pores become larger and the skin begins to thicken. Men are more likely to suffer from rhinophyma, and the condition often begins to show noticeable symptoms between the ages of 30 to 50. Topical treatments and medications are usually only effective during the developing stages of the condition. Once disfigurement takes place, patients may need to explore cosmetic alternatives to reduce the impact of rhinophyma. Treatment involves removing the damaged tissue and using cosmetic techniques to reshape the nose. Due to the potential severity of rhinophyma, it is important to consult with a rhinoplasty specialist who understands the condition. Dr. Khosh will take great care to carefully remove tissue so as to avoid unnecessary nerve damage. In many cases, rhinophyma impacts the functionality of the nasal passage. Before providing treatment, Dr. Khosh will take you through a full consultation where he will discuss the potential results of treatment and address any concerns about the procedure. Rhinoplasty is a specialist area of cosmetic surgery. There are a number of considerations which impact the results of rhinoplasty, not least among them the ethnicity of the patient. The two main concerns when pursuing rhinoplasty are the aesthetic framing and functionality of the nose. Some plastic surgeons have neither the skill nor experience to ensure that optimum results are achieved in balancing both features. Ethnicity plays a major role in how the nose looks and functions. Dr. Khosh specializes in ethnic rhinoplasty procedures that are designed to enhance the appearance of the nose without sacrificing nasal functions. Each patient will also receive a comprehensive consultation to discuss desired results of treatment. You will have the opportunity to ask questions and make any necessary plans in preparation for treatment and recovery. Dr. Khosh provides rhinoplasty treatment that can reduce or enhance prominent features that are associated with the patient’s ethnicity. The goal is to provide the patient with a nose shape, width or height that blends perfectly with the other features of the face for better aesthetics. If you are looking for an ethnic rhinoplasty specialist in Manhattan, Dr. Khosh has a range of treatment options to suit every need. Perceptions surrounding appearance can shape a person’s self-confidence for life. Many of these perceptions are formed through early childhood and into the teenage years. Dr. Khosh specializes in treating teenagers who are self-conscious about the size or shape of their nose. There are treatment options available for teens, which are carried out only after counseling and consultation with a specialist rhinoplasty surgeon such as Dr. Khosh. If you have any concerns about your teen going through rhinoplasty surgery or procedures, it is important to discuss them with a doctor who understands the challenges and implications involved. Dr. Khosh is a dual board certified cosmetic surgeon who will consider a number of factors before recommending rhinoplasty for young teens. One of the most crucial considerations is the development of the nose and how rhinoplasty would impact function. If the nose is inhibited from growing, it can have a negative effect on breathing. Dr. Khosh will provide a full assessment in order to determine the functional and psychological impact of treatment on teens. If you believe that your teen is a viable candidate for rhinoplasty, reach out to the offices of Dr. Khosh in Manhattan today to learn more about the procedure. Sometimes a cosmetic surgeon simply does not have the experience or skill to deliver desired rhinoplasty results. In these cases, Dr. Khosh can offer rhinoplasty revisions to correct issues with symmetry, aesthetics or nasal function. When you have already been through one or more rhinoplasty surgeries or treatments, it is important to consult with a doctor who has experience in revising potentially harmful errors. Dr. Khosh has provided countless rhinoplasty revisions to patients in Manhattan. The process involves an in-depth consultation and needs assessment to ensure you get the right results. It is crucial that the functions and structures of the nose are protected when additional surgeries are performed. You will be given the chance to discuss any concerns you may have, allowing you to make informed choices about the direction of revisions before treatment begins. The goal of a rhinoplasty revision is not only to correct previous errors but to provide the patient with a nose that blends with other facial features in a way that is pleasing. Dr. Khosh offers excellence in treatment to patients of all ethnicities and can also cater to teens, in many cases. If you have had a botched rhinoplasty, reach out to the offices of Dr. Khosh to discuss revision options today. When there is a loss of cartilage in the nose, it will impact the structure, which may result in the integrity of the nose becoming compromised to the point of collapse. This condition is rare, but, for those who suffer from saddle nose, the aesthetic and functional impacts are often considerable. Due to the severity of the condition, rhinoplasty carried out by a specialist cosmetic surgeon is usually the most effective corrective option. 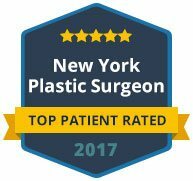 Dr. Khosh is one of the most compassionate and understanding rhinoplasty specialists in Manhattan. He provides extensive counseling and private consultation to patients who need reparative surgery for conditions such as a collapsed nose. This type of treatment requires a delicate approach to ensure optimum outcomes. If your self-confidence or nasal function is being negatively impacted by saddle nose, a consultation with Dr. Khosh will allow you to explore all your treatment options. There are various techniques which are used in the repair of a saddle nose deformity, each of which is suited to different patient needs. Dr. Khosh has the experience and knowledge of the most effective treatment options to restore functionality and create a more aesthetically pleasing focal point in the nose. 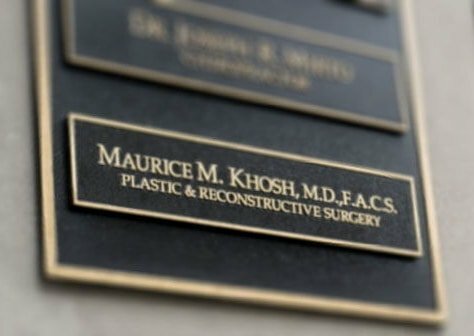 Dr. Khosh is a uniquely qualified rhinoplasty specialist based on his training, experience and double board certification in facial plastic surgery and otolaryngology. He has been selected as “America’s Top Rhinoplasty Surgeon” by his peers and patients, an honor bestowed to a few surgeons nationally. He has intimate knowledge of the functional anatomy of the nose, which enables him to provide cosmetic improvement of the nose without sacrificing breathing function. He is an expert in both the endo-nasal, or closed approach, and external, or open approach, for rhinoplasty. In appropriately selected patients, Dr. Khosh performs non-surgical rhinoplasty as a simple office procedure without the need for anesthesia. Dr. Khosh meticulously tailors your rhinoplasty to your specific needs with the ultimate goal of achieving a beautiful and natural appearing nose. Contact our office today to schedule your consultation or if you have any questions regarding a rhinoplasty or nose job procedure. This 40 year old lady requested rhinoplasty in Manhattan to address a nasal hump, and refine the nasal tip. An open rhinoplasty approach was used to remove the nasal hump and and to modify the tip. Who is a good candidate to undergo rhinoplasty? Any female older than 16 and any male older than 17, who is in a relatively good state of health and has reasonable expectations from cosmetic nasal surgery. Those with moderate skin thickness (not too thick and not too thin) and strong nasal cartilages can expect better results. Who is a poor candidate for rhinoplasty? Patients with complicated medical problems such as poorly controlled asthma, high blood pressure, or diabetes, and those who have unrealistic expectations from cosmetic surgery. Does Dr. Khosh sub-specialize in rhinoplasty? Dr. Khosh is a well-known expert in rhinoplasty in Manhattan and the New York Tri-State area. He is double board certified in facial plastic surgery and otolaryngology and can address the breathing function as well as the aesthetic appearance of the nose. Dr. Khosh handles challenging nasal reconstructive procedures that are referred by other specialists. He performs revision rhinoplasty and rhinoplasty following facial trauma or a cancer ablation, utilizing techniques such as bone grafts, ear cartilage grafts or rib cartilage grafts. What are the different approach techniques for rhinoplasty? There are two main approaches for performing rhinoplasty, closed and open. In the closed approach, all incisions are inside the nose. In the open approach, nearly all incisions are internal except a well-hidden incision in the bottom of the midline part of the nose. Dr. Khosh is proficient in both methods. 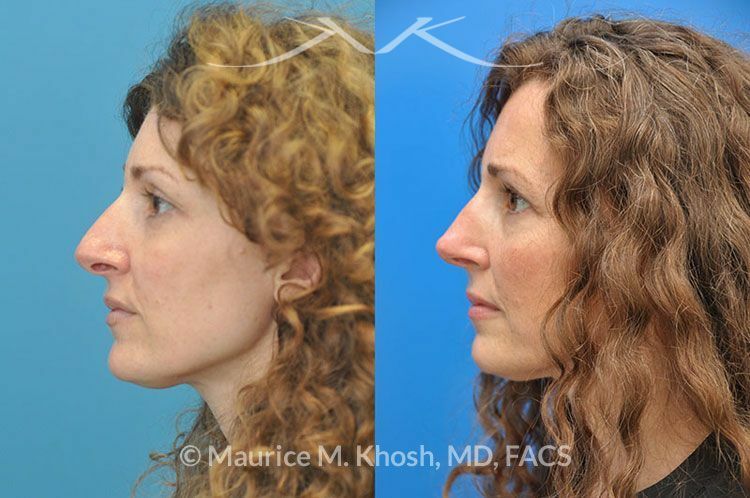 How does Dr. Khosh determine which approach to use for rhinoplasty? Dr. Khosh chooses the surgical technique based on a patient’s features and desired effect. In revision rhinoplasty, typically, an open approach is employed since it offers better visualization of the nasal cartilages and bones. In primary rhinoplasty, the open approach is only undertaken when significant nasal tip work is desired or when notable asymmetry is present. What kind of anesthesia does Dr. Khosh use for rhinoplasty? Dr. Khosh utilizes general anesthesia, as this technique allows for complete control of a patient’s breathing, and it translates into the safest method of providing anesthesia. Additionally, general anesthesia avoids the risk of a patient coughing or moving during surgery. What kind of pain or discomfort should I except after rhinoplasty? Surprisingly, there is little discomfort with rhinoplasty. Some surgeons use packing inside the nose, which is uncomfortable and painful. Dr. Khosh does not use packing. Most patients do not need any pain medication past the third day. What is the typical recovery after rhinoplasty? Recovery after rhinoplasty is generally quick. It is quite rare to develop extensive bruising that you may have seen on an extreme makeover show. Most bruising is resolved after five days. External tape and casts, as well as any internal stents, are removed after six days. Patients may return to work within ten days. However, the final results may take up to six months to appear. How do you make the tip the nose smaller? The shape, size, and position of the nasal tip is created by a pair of boomerang shaped cartilage in the lower nose known as the lower lateral or alar cartilage. Alterations in the shape and size of this cartilage create a corresponding change in the appearance of the nasal tip. Trimming of the alar cartilage, placing stitches to bend the cartilage and using supportive cartilage grafts allow precise alterations in the appearance of the tip of the nasal tip. How do you remove a hump from the nose? The nasal bridge, or the dorsum, of the nose, is composed of paired nasal bones and their matching, attached cartilage (upper lateral cartilage). Removing a nose hump requires exposure of the upper lateral cartilage and the nasal bones through an incision inside the nose and shaving of the bones and cartilage. How do you narrow the bridge of the nose? When narrowing of the nasal bridge is necessary, a small chisel is used to cut the nasal bones so they can be pushed toward one another. A nasal hump can be removed at the same time as described above. How long will I be bruised after a nose job? Bruising after any type of surgery is due to leaking blood under the skin. In rhinoplasty, bruising is most commonly associated with shaving or chiseling of the nasal bones. In most nose job surgeries, bruising is resolved within ten days. This duration is affected by the extent and duration of the operation. Can the cast on my nose get wet after my nose job? A plastic cast is used after rhinoplasty. Initially, a tape is applied to the nasal skin and the plastic cast is then attached to the tape. This type of cast may get wet. I inform my patients that they may shower and get the cast wet. However, I recommend against swimming. When can I wear makeup after a nose job or rhinoplasty? Makeup can be worn as early as two days after rhinoplasty. Obviously, no makeup can be applied to any visible incisions around the nose. However, makeup and concealer can be applied around the eyes and cheeks. Rhinoplasty is commonly performed with septoplasty (correction of a deviated septum) and turbinate (internal nasal membrane) reduction to enhance breathing. In some revision rhinoplasties, and in rare primary rhinoplasty procedures, repair of the nasal valve may also be warranted to ensure good breathing. In order to achieve balance in the face, chin augmentation may be recommended during a rhinoplasty consultation. Sinus surgery can be safely combined with rhinoplasty in individuals with chronic sinus issues.